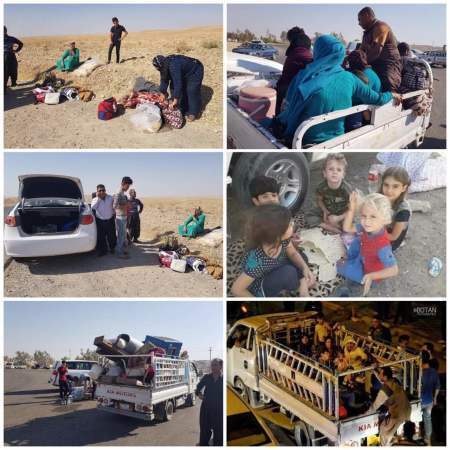 After the Iraqi Army and People’s Mobilized Forces launched multiple offensives to Kirkuk, Khanaqin, Khurmatu, Prde and other areas during the last four days resulted in dire humanitarian consequences and mass waves of displacement of the civilians from their homes and fled to the cities of Erbil and Slemani due to indiscriminate violence, torture, looting, burning civilians’ homes and properties, especially the Kurdish people in these areas. So far, one hundred sixty-eight thousand and three hundred seventy-two (168,372) civilians have been displaced from Kirkuk, Khanaqin, Khurmatu, Zummar and Rabea to Kurdistan Region; (84,000 arrived in Erbil, 78,372 arrived in Slemani and 6000 arrived in Duhok and Zakho from Zummar and Rabea). Majority of the displaced people are hosted by relatives, family friends and host communities, while high number settled in unfinished buildings and public places and camps. They are living in a very difficult situation and need urgent humanitarian assistance including food, water, milk, diapers, cloths, shoes, blankets, kerosene for heating, shelter as well as medical aids. Under the direct supervision of the KRG Minister of Interior, Joint Crisis Coordination Centre in close cooperation and coordination with the governorates’ Office of Crisis Response and other local and international partners continues to mobilize the most urgent humanitarian needs and secure shelter for the displaced people. Due to the continuous escalation and offensives by the Iraqi Army and People’s Mobilized Force, violence and threats on the civilians, it is expected that majority of the people who stayed will be obliged to flee for their safety from the militia and armed groups and creating a catastrophic humanitarian crisis.